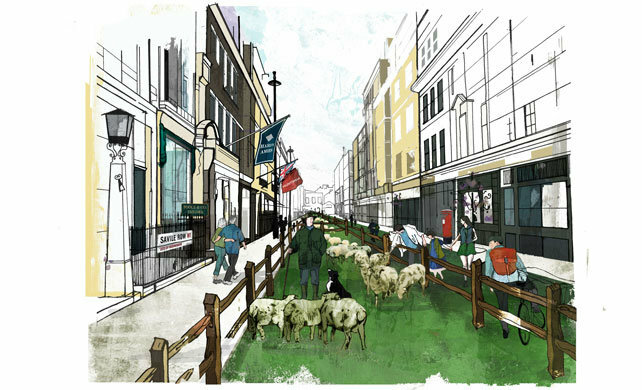 On 11th October 2010, Savile Row was fenced off and the road taken over by dozens of sheep. The day was intended to launch the Campaign for Wool – an initiative convened by HRH Prince of Wales and designed to highlight the benefits of wool as a textile and to the industry it supports. Wool is an absolutely fascinating fabric – read more about it’s importance here. See also: bespoke tailors, campaign for wool, Henry Herbert, Henry Herbert Tailors, hrh prince of wales, hrh the prince of wales, london mayfair tailor, October, prince of wales, Savile Row, savile row tailors, sheep, Wales, wool, wool suits. Savile Row Field Day - Bespoke Suits By Savile Row Tailors.